The Jesuit Marauders JV baseball team played the Sheldon Huskies at Jesuit High School. This was a make-up of a rain-out last Friday night. The Marauders beat the Huskies by the scores of 12 to 2 and 13 to 12 last week. Working in Sonora, I watched the Gamecast while Rod scored. Leading off, Jack was 0 for 1 with three walks. Talking to Rod at Monday night's game, I had noted that Jack hadn't walked as much this year! Although he walked three times, he never scored!?! In his first at-bat, Jack grounded a 3 and 2 pitch to the shortstop and was thrown out at first. Jack walked on four pitches in his second plate appearance. Breaking for second, he got tagged out on a 1-3-6 pick off. In his third at-bat, Jack walked on five pitches. He went to second when Iwasa was hit by a pitch, but ended headed the inning there when Cosca struck out looking. Jack walked on four pitches in his fourth plate appearance to lead off the bottom of the sixth. He went from first to third on Iwasa's single to left. With no outs, the Marauders couldn't get him home. Cosca flew out to short left field, Alex struck out swinging and Jared struck out looking. Playing centerfield, Jack had one put-out. 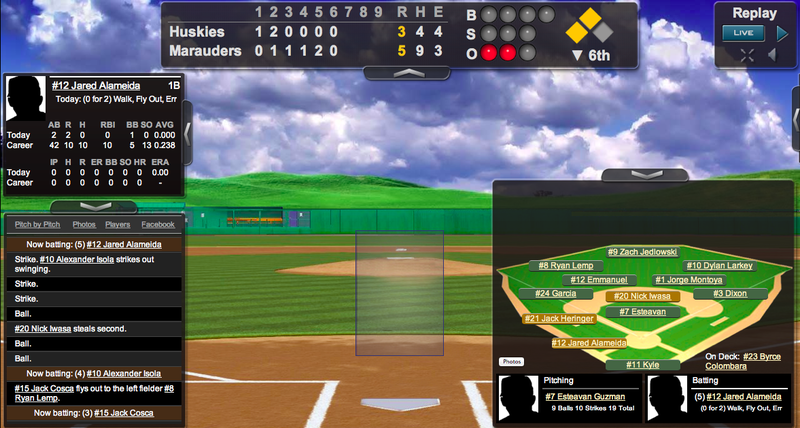 With the starting pitcher struggling to find the plate, the Marauders fell behind 3 to 0 in the top of the second. Bringing in a new pitcher and then plating runs in the next four innings, the Marauders beat the Huskies by the score of 5 to 3. The box score is here and the scorecard is here. Beards (2-0, 1 save, 2 starts, 6 appearances, 20.00 innings, ERA 1.75) was the winning pitcher. He struck out nine in 5 1/3 innings, while walking only one batter. The Jesuit JV baseball team now has 19 wins and 4 losses. Their league record is 9 wins and 1 loss. The game log is here.